From the bold cabernets to the sweet moscatos to the sparkling wines and champagnes, our remarkable wine selection is a plethora of spirits for any occasion. From Dreaming Tree Cabernet to Stella Rosa Moscato to Moet Champagne, our wine and champagne assortment is one of the best in Cullman. 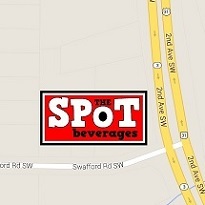 The Spot Beverages is dedicated to offering our customers a great variety with the highest level of knowledge and customer service. Whether you are in need of something quick for the dinner party or the reception of a lifetime, our store has an abundance of superb options that are sure to satisfy and please everyone. If you need a recommendation or have a question, then please give us a call or you can go to the “Contact Us” page and fill out the form. Remember to check #cullmanwinestore for the latest wine and champagne specials.